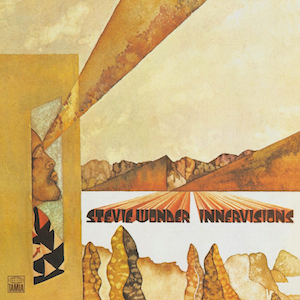 This week, I’ve been listening to Stevie Wonder’s 1973 album “Innervisions” for lessons I can learn to improve my craft as a songwriter. For years, my only real awareness of Stevie Wonder was his work in the 1980s. At eight years old, I saw his appearance on the Cosby Show. I watched it many times on VHS and used to sing the song “I Just Call To Say I Love You” throughout my childhood. By the time I hit my teens, I grew to find songs like this and “Ebony and Ivory” were just cheesy. I didn’t become aware of his fantastic 1970s work until fairly recently. Some of the stuff I had heard before without realizing who it was. I absolutely loved spending a week getting to know this album. Wonder is an accomplished multi-instrumentalist and plays many of the instruments on the album. Every instruments on “Living for the City” is played by Stevie Wonder. Fender Rhodes electric piano opens the song spinning left-right through the stereo tremolo. As with much of the album, Wonder makes use of the legendary TONTO for fantastic synthesizer sounds. Once the drums start, the kick hits on every quarter note through the verse and chorus, though changes for the bridge. The chord progression is very simple for the verse: I – ii – I7 – ii, with the synth bass mostly bouncing on on the tonic every quarter note. The chorus rises through a IV-IV-V6-V7 progression. The da-da-da-da bridge contrast with the rest of the song by being in 3/4 time as borrowing a series of chords from outside of the key. The first chord of the bridge could be vi7♭5, then to vi♭ to v♭ coming done to ii♭ back to I. Though the music is funky with a definitely bouncing groove, it would feel rather laid back without the vocals. Wonder’s singing gives the track its energy. He sings the verses with a rhythm and a simple melody; it’s almost rapping. He also punctuates the rhythm with non-verbal grunts, pops and ‘hee’s;’ Michael Jackson undoubtedly drew influence from Stevie Wonder. The synth bass and electric piano may be the heart of the accompaniment, but the vocals are the drive. One of my favorite tracks, “He’s Misstra Know-It-All” closes the album. Wonder provides all vocals and plays all instruments except the electric bass guitar. Acoustic piano plays chords throughout. The chord progressions runs I-I7-I6-iv6-I-V-IV for the verses and a bridge/chorus of ii-I-IV-V-vi7-V-I-ii7. This use of extended chords provides interesting movement while essentially staying in the same chord. A different idea for me, that seems so natural in the song, is the use of multiple time signatures within the verses. The whole song is in 4/4 time with an exception at the end of each verse. Every verse has the refrain “He’s miistra Know-It-All” in 2/4 time. I like the use of synthesizers to add little magical flourishes to the top end of the piano lines. Sometimes they are like soft sparkles drifting into the air. At the half-way point, Stevie’s vocals pick up in energy and hand-claps increase the sense of energy. It also helps the song feel like it’s coming to a close.